I love this, so cute and crafted very well. 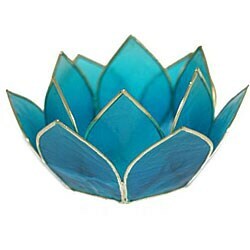 This gracefully proportioned tea light holder has two rings of translucent capiz shells, with silver edging and base. Each light holder is handcrafted by artisans in the Philippines. This item was made in Pananque, Philippines under the guidance of Mr. Chito Navoa and his family. Single Capiz shells are extracted by hand and individually placed in the handcrafted metal frame of the Lotus Flower by our craftsmen who then polish, paint and lacquer each individual piece until it glows with color and vibrancy. The Navoa family business supports many talented artists and craftsmen, giving them an opportunity to make a living. Through your purchase of this product, you help contribute to their livelihood. I got these as decoration for a silver wedding anniversary. The metal part of the tealight holder is brass color, not silver as described.